In its innovative magazines and books, Flow celebrates creativity, mindfulness, and the pleasures of paper through a uniquely appealing marriage of ideas and visuals--beautiful illustrations and paintings created by a group of talented professional artists. Now those same artists have opened up their toolkits, sharing secrets, techniques, and point of view to teach the creatively curious how to draw. 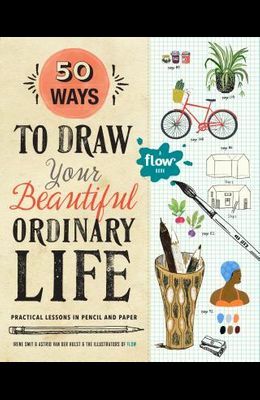 Here are 50 easy, illustrated step-by-step lessons on how to draw a whimsically curated list of the things we see and interact with every day: a bouquet of flowers, a watering can, a cat, mittens, favorite plants and vegetables, a cup and saucer, a kitchen table, fruit wrappers, a seagull, a dress collar, an apple tree. The lessons take us line by line from early sketch to finished drawing, with space alongside for the reader to draw the same. And unlike other beginner's drawing guides, every lesson stems from each artist's particular sensibility. This book is not about learning shapes, but how to create beautiful images with quirkiness and personality. The focus is not on perspective or shading, but the mindful pleasures of doing creative work. Included are special paper goodies, from the instructional (sheets of tracing paper, watercolor paper, colored paper for a singular effect) to the purely joyful--postcards, a 32-page booklet with bellyband, paper doll foldouts, and more.